An idyllic Greek island. Obsessed demigods. A fallen nymph. A mortal boy. Merope, a beautiful but faded star nymph, is banished to Earth for displeasing the gods. She tries to fit in, go to school and live a normal "human" life. And then she meets Lukas - but relationships between men and goddesses are forbidden. Will their love grow? Or will Merope and Lukas feel the wrath of the gods? Merope is a Star Nymph that has been promised to the heavenly tyrant Orion, an aggressive demigod that will stop at nothing until he has her firmly in his grasp. Merope's only escape is to hide on Earth among mortals. Aalong with her Uncle and guardian Prometheus, the two settle among the natives on the small Greek island, banished by Zeus as a consequence of not accepting her role as consort. Earth is a new and dangerous world, where Merope finds herself choosing to live in solace. Human's have always been strange creatures, unattractive and emotional beyond comprehension compared to the heavenly beings that Merope has spent centuries in the company of. So when local boy Lukas breezes into her life, Merope realises that she's been severely misinformed. Her instant attraction to Lukas is pulverising, and a chance meeting on the beach now consumes her thoughts. But the distraction has cost her dearly, with Orion and Heracles having tracked her down. But thankfully the heavens have allowed Merope to stay on Earth, much to Orion's disgust. He has proclaimed that she shall have three months to decide her fate, and only then will he return to force her home. But she needs to immerse herself within the community, blending into everyday life as a teen at school. Despite her protests, Prometheus arranges for a guided tour with local girl Eleni. Merope carefully navigates living as a mortal, but she can't escape the attention of Lukas. Law states that Nymphs cannot engage in human relations with mortals, with a forbidden romance promising more than just banishment. But as she spends more time in the company of the sweet and kind hearted boy, Merope finds herself struggling to resist him. While pushing Lukas away, Merope needs to evade her new minder, Heracles, who's on a mission to watch over the fallen Star Nymph. At home, Heracles barely noticed the meek and shy girl, preferring to spend his days charming more attractive beings, but here on Earth he might just be beginning to see why the mortal is so enamoured with her. But as the tensions begins to build between friends, mortals and beings, cracks begin to form and Merope may have just blown their cover. Suddenly three months on Earth doesn't seem long enough. 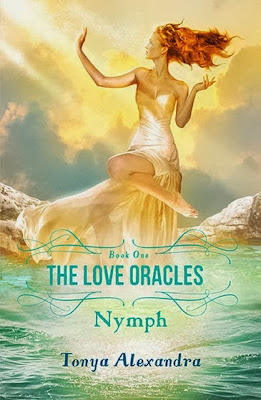 Nymph, book one in The Love Oracles series, is an easy mix of forbidden love, mythology and navigating a world that isn't your own. Merope is a Star Nymph who isn't the fragile and agreeable servant that her counterparts are. Rejecting the advances of Orion, a demigod who loves the thrill of the chase, she is sent to Earth... And the results are entertaining to say the least. Thank goodness for Eleni, without her guidance Merope would have been a social outcast. Her misfortunes are hilarious, I really enjoyed how author Tonya Alexandra created what seemed to be a perfect being, but thrust into a world where she's not overly popular, intelligent or excels beyond the teens she's trying to emulate. Although she's bound by the laws of her own world, being out of her element makes Merope more human that you'd expect. The star of Nymph is Heracles, a chauvinistic, fashion conscious god who is sent by Orion to keep an eye on the sassy and unpredictable Star Nymph. But slowly by surely, he starts to warm to Merope where someone is bound to have their feelings hurt. Fans of Becca Fitzpatrick will enjoy The Love Oracles series, Nymph reminded me of the hugely popular Hush Hush but targeted at the larger audience. I really enjoyed the mythology aspects and seeing what are generally immaculate gods as nothing more than chauvinistic and controlling rulers that flaunt their double standards and see the race of Nymphs as nothing more than servants. Nymph is perfect for the teen audience or those looking for a fun, flirty read. I'm glad you enjoyed the mythology but I guess I found it wasn't for me. It was a coming of age for Merope I think. I personally found it a little young overall Jeann, but I did enjoy the mythology. I can't recall having read anything about Star Nymphs before, so I could appreciate the uniqueness. Great review. I enjoyed nymph too. I didn't think much of Heracles at first, but once he came to earth he was just so funny that I ended up loving him. I look forward to reading the second book. I actually wouldn't mind reading a Heracles series, based on his arrogant personality, it would be entertaining to say the least. Thanks for stopping by Rochelle. Probably the same brazen cheeky nature. I agree, he was my favourite character too.